The new policies of the government to boost exports has among its focus areas five key elements, namely, agriculture, horticulture, plantation, fisheries and meat, according to the Union Commerce and Industry Minister, Mr Suresh Prabhu. He added that the policies will ensure the doubling of exports, currently pegged at $ 321 billion, in a few years. "It is our endeavour to increase India's exports from the current $ 321 billion to almost double in a few years. One of the principal potential areas for export is fisheries, especially at a time when, for the first time, the country has come out with an agricultural policy," Mr Prabhu said. He pointed out that the Air Cargo policy, announced this month, will boost fish exports, adding that the Centre and Goa government would tie up to form clusters to make value-added products. He added that vegetables, fruits, cashew and fish can be exported from Goa, for which a marine export development agency has been created, reports said. Foreign direct investment (FDI) during the previous fiscal grew 18 per cent to Rs 28.25 lakh crore (Rs.28.25 trillion), data from the Reserve Bank of India (RBI) showed Monday. FDI increased by Rs 4,33,300 crore (Rs.4.3 trillion), including revaluation of past investments, during 2017-18 to reach Rs 28,24,600 crore (Rs.28.2 trillion) in March 2018 at market value, according to RBI data on 'Census on Foreign Liabilities and Assets of Indian Direct Investment Companies, 2017-18'. Overseas direct investment (ODI) by Indian companies increased by 5 per cent to Rs 5.28 lakh crore (Rs.5.28 trillion). "FDI companies witnessed a substantial increase in other investment liabilities, largely due to the increase in trade credit," the RBI said. The census showed that Mauritius continued to be the largest source of FDI in India (19.7 per cent) followed by the US, the UK, Singapore and Japan. At the aggregate level, foreign equity participation was very high as 84 per cent of the companies that reported inward FDI were subsidiaries of foreign companies (i.e., single foreign investor holding more than 50 per cent of total equity), RBI said. President Ram Nath Kovind has said that India's contribution to the global economy has increased from 2.6 per cent in 2014 to 3.3 per cent in 2017 on the back of high growth rate during the last four and a half years. Prime Minister Narendra Modi recently said India is on the way to becoming the fifth largest economy in the world. Speaking at a Summit, he said India is the world's fastest-growing major economy and the Government is committed to building a ''New India'' with next generation infrastructure. PM Modi also informed that India has jumped to the 77th position in the latest edition of World Bank's Ease of Doing Business Report, which is an improvement of 65 places in the last four years. "The revival of the phytosanitary protocol with China will pave the way for revival of Indian tobacco exports to China and prove economically beneficial to Indian farmers," department of commerce said in a statement on Monday. "Quality tobacco on par with international standards is available in India at competitive prices and there is good potential for export of Indian tobacco to China," the department said. India wants to triple exports to Argentina, eyeing an additional $1.5 billion worth of shipments, and is seeking market access for apparel, textiles, folding bicycles and home furnishing products in the South American Country. Ahead of Argentine President Mauricio Macri's likely visit to India next month, India is also keen to promote ethnic products such as Alphonso mangoes and Khadi. "Sophisticated high-end bicycles and bicycle components alone have the potential to offer a $1-billion export opportunity to Indian exporters with another $300-350 million coming from the apparel and textiles industry. There might be collaborations with companies from both countries," said an official. Indian exporters of office stationery, handicrafts and home furnishing products have pushed for the removal of non-tariff barriers such as custom clearances to help increase current exports of $10 million to $100 million. Exporters also want a reduction in the 25% import duty on sports equipment. India's exports to Argentina were $708.7 million in 2017-18, consisting mainly of organic chemicals, vehicles and auto parts, lubricants, machinery, sound and image devices and garments. Imports from Argentina were $2.2 billion, mainly soybean oil, petroleum, copper, sunflower oil, leather, wool and ferroalloys. Reduction of logistics cost by 10 per cent will help boost the country's exports by about 5-8 per cent, exporters body FIEO said Thursday. Federation of Indian Export Organisations (FIEO) President Ganesh Kumar Gupta said that implementation of the Goods and Services Tax (GST) has helped growth of the logistics sector, which is very critical in increasing international trade. High logistics cost impacts competitiveness of domestic goods in the international markets. The cost of logistics for India is about 14 per cent of its GDP and it is far high as compared to other countries. "It is estimated that a 10 per cent decrease in indirect logistics cost can increase 5-8 per cent of exports," Gupta told reporters here. The commerce ministry is working on a national logistics policy, which is aimed at promoting seamless movement of goods across the country and reducing high transaction cost of traders. He also said that to develop this sector in an integrated way, it is important to focus on new technology, improved investment, skilling, removing bottlenecks, improving inter modal transportation, automation, single window system for giving clearances, and simplifying processes. Talking about the programme, Gupta said logistics companies from about 27 countries are participating in the three-day show in the national capital. "LOGIX India 2019 is an initiative to improve India's trade with regions like Africa, ASEAN, Afghanistan, Iran, and Iraq," he said. Over 130 International delegates representing logistics and freight forwarders professionals are attending the event. FIEO DG Ajay Sahai said that through this, the federation will seek foreign investments and joint ventures in the sector. Currently, India is ranked 44 in the World Bank Logistics Performance Index 2018 out of 160 countries. The Indian logistics market, which is worth around USD 160 billion, is expected to reach about USD 215 billion by 2020, as per Economic Survey 2017- 18. The domestic logistics industry provides employment to more than 22 million. The Union Minister of State for Shipping, Road Transport and Highways and Chemicals and Fertilisers, Mr Mansukh Mandaviya, has said that the Ministry of Shipping has strived to improve employment generation in the shipping sector during the last four years. He said the number of trained active seafarers today is 1.54 lakh, of which 4,700 are women. He added that as many as 810 women are employed in the shipping sector. The last four years saw an unprecedented growth of 42.3 per cent in shipboard jobs for Indian seafarers. The seafarers employed on ships worldwide increased from 1,08,446 in 2013 to 1,54,349 in 2017. India now provides 9.35 per cent of the global seafarers and ranks third in the list of the largest seafarer supplying nation to the world maritime industry, he highlighted. The Directorate-General of Shipping has started issuing Indian CDC for candidates who have completed the five basic STCW courses, since January 2018. Prior to this, candidates who were doing the long duration pre-sea courses were issued Indian CDC. This initiative of the Directorate has mobilised a lot of seafarers to pursue Indian CDC, who otherwise were holding CDC for other flags like Panama, Liberia, etc. The ban on opening of new pre-sea and post-sea institutes has been lifted and the various requirements for approval of courses too delinked. This has considerably helped in the setting up of new maritime training institutes, which will contribute to further increasing the number of Indian seafarers in the global market, the Minister added, as per a release. Tripura Chief Minister, Mr Biplab Kumar Deb, has said that Indian and Bangladeshi officials will finalise various aspects of a proposed waterway between the two countries. "Union Shipping Ministry officials have informed that senior authorities from both the countries, including from the Inland Waterways Authority of India (IWAI), will visit Tripura on January 28-29. The officials would finalise different issues of the proposed waterway between the two countries involving Tripura," Mr Deb told newspersons. He said that construction works to develop the 35-km waterway between Tripura's river Gomati and Meghna river in Bangladesh is slated to begin next month. "The project works were delayed due to the parliamentary elections in Bangladesh," he said. "After the development of the new waterway, movement of vessels and cruises would be possible to ferry people and goods. It would promote trade, tourism and people-to-people contact." A four-member IWAI team had visited Tripura's Sonamura last month to select the site for a jetty. The famous Akhaura canal, built by the erstwhile kings of the princely state of Tripura, was earlier used to ferry goods to-and-from Bangladesh by boats and small vessels. The Indian Oil Corporation in 2016 had ferried diesel and cooking gas to Tripura from Assam via Bangladesh. Besides, the Food Corporation of India transported 23,000 tonnes of rice in three phases since 2014 from Kolkata to Tripura via Bangladesh using Dhaka's Ashuganj River Port which is about 50 km from Tripura. In 2012, Bangladesh had allowed state-owned Oil and Natural Gas Corporation to ferry heavy machinery, turbines and over-dimensional cargoes through Ashuganj port for the 726-MW Palatana Mega Power Project in southern Tripura. According to the Union Shipping Ministry, of the 111 National Waterways, 20 are in the landlocked North-Eastern region, mostly in Assam. And there are 54 rivers flowing between India and Bangladesh, reports said. IATA's recently released report on India's air transport sector has also highlighted the strong performance of the country's air cargo segment. This is particularly the case given India's integration into the global pharmaceutical value chains-a strong growth performer for the air cargo segment over recent years. Nonetheless, 2017 was also an impressive year of growth for the Indian air cargo market. The total cargo tonnage flown from India crossed the one-million tonne threshold in 2017, with a strong, double-digit growth rate of 16.9 per cent. 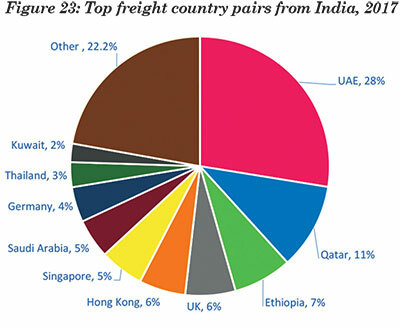 The top ten trading partner countries for Indian air cargo account for almost 78 per cent of the total (Figure 23). The UAE leads the way with almost a 30 per cent market share, followed by Qatar with 11 per cent. Figure 24 depicts the relative market size (in tonnes) and the annual growth rate of India's top 10 air cargo trading partners. 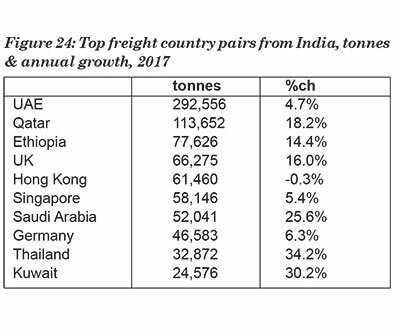 While the UAE is clearly the largest market by some margin, the fastest growing market was Ethiopia, which more than doubled its cargo tonnage with India in 2017. Kuwait and Thailand also deserve a mention with growth exceeding 30 per cent for the year for both countries. Of the top ten markets, Hong Kong was the only one to see a fall in its cargo tonnage with India in 2017, down a modest 0.3 per cent compared with its 2016 volume. As was the case on the passenger side, India has two airports ranked in the global top 10 fastest growing in 2017, namely, Mumbai and Chennai. 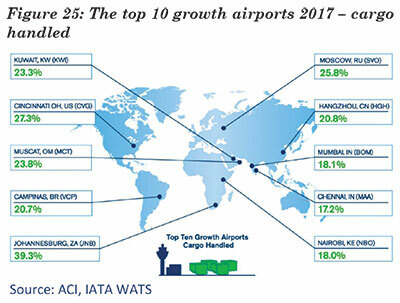 These two airports recorded very strong growth of 18.1 per cent and 17.2 per cent, respectively, in 2017 (Figure 25). In terms of global rankings, Dehli and Mumbai appear in the list of the top 50 airports for freight handled, at #29 and #31, respectively, the report said. 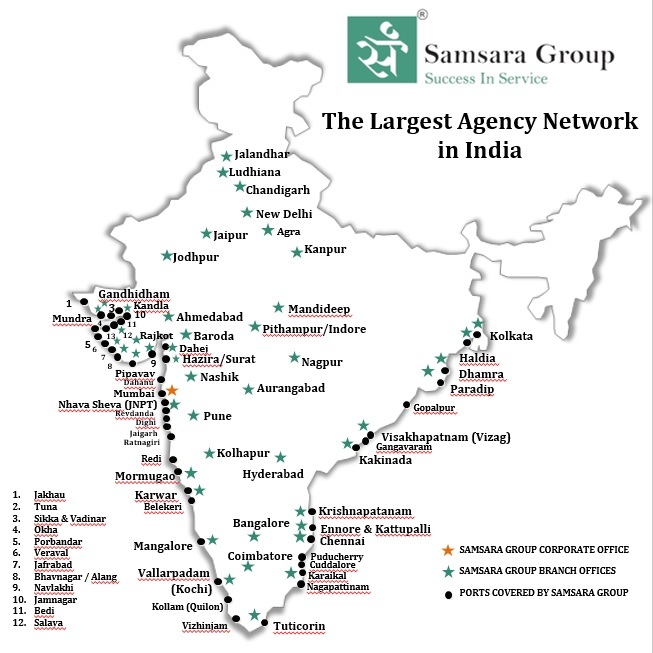 Gujarat-based infrastructure major Adani group and textile biggie Welspun Group are setting up logistics parks on Hyderabad's outskirts for which both have acquired land, Jayesh Ranjan, IT and industries principal secretary, Telangana said here on Wednesday. The Telangana government's investment friendly policies and Hyderabad's central geographical location in the country make it an ideal logistics hub, Ranjan said on the sidelines of the industry body Ficci's national executive committee meeting in the city. The Welspun group has earmarked 100 acres of land for the dedicated logistics park out of the 600-acre parcel of land that it has acquired in Ranga Reddy district, Ranjan said. On the other hand, the Adani group has acquired 25 acres a short distance away from the site of its unmanned aerial vehicles manufacturing facility at Shamshabad, which it has set up in joint venture with Israeli player Elbit Systems at an initial investment of $15 million, he said. The $11 billion turnover Adani group, which has interests in infrastructure, real estate, FMCG and now aerospace and defence, unveiled the 50,000 sft UAV facility at the 20-acre Adani Aerospace Park at Shamshabad in December 2018. The $2.3 billion turnover Welspun group is pumping in Rs 1,200 crore (Rs.12 billion) in setting up an integrated flooring solutions plant in Hyderabad. Mumbai Port, which has expertise in handling bulk, break-bulk and project cargo, started handling raw sugar in bags in bulk from last month. As on date, two vessels, MV Rising and MV Westgate, have sailed for Somalia and Chittagong, Bangladesh after loading 16,095 MT and 26,868 MT of the commodity, respectively. Most of the sugar was received at the port from Indapur and Baramati through rail wagons. The cargo, after being unloaded from the wagons, is stored in the sheds, where, importantly, the port has granted concessional 30 free days storage exclusively for sugar. On January 15, 2019, the port achieved a record in the shipment of sugar in bulk by loading 7,004 MT in a single day. This was made possible due to the coordinated efforts of the port officials and labour, as well as Srinath Agencies, the handling agent. Mumbai Port is expected to handle about 8 lakh MT of sugar in the next nine months and is geared up for future shipments, emphasised a release. While speaking at the Republic Day celebration at Paradip Port, the Chairman of Paradip Port Trust (PPT), Mr Rinkesh Roy, said that the port is likely to increase its cargo handling to 110 million metric tonnes (MMT) during the current fiscal, up from the 102 MMT handled last year. "The port is expected to reach 110 MMT mark in terms of cargo handling this fiscal, exhibiting a compounded annual growth rate of 11.56 per cent," he said. During 2017-18, PPT had joined the exclusive club of 100-million-tonne ports by handling a record 102 MMT, which was the second highest throughput achieved among all Major Ports and the third highest among all ports in India. Mr Roy said the port's capacity has been rated at 277 MTPA, making it the largest in the country, while the effective capacity has been increased to 234 MTPA. "Operationally, it has scaled new heights in terms of innovations and efficiency," he observed. The Mechanised Coal Handling Plant (MCHP) has shown improvement in efficiency by 65 per cent, loading 1.32 lakh MT in a single day in comparison to 1.01 lakh MT in 2014-15, the PPT Chairman highlighted. The iron ore handling plant has shown an even better 141 per cent improvement in efficiency, with the net loading rate currently at 1,000 TPH, up from just 414 TPH in 2014-15, he added. He also highlighted that the Marine Department handled a record 27 vessel movements in just 20 hours, an all-time record traffic of 6.39 lakh MT was handled in a single day on October 14, 2018, and an all-time high monthly traffic of 10.18 MMT was handled during January 2018, reports said. The DP World-operated Nhava Sheva International Container Terminal with Jawaharlal Nehru Container Terminal and Jawaharlal Nehru Custom House have flagged off the Container Corporation of India's (CONCOR) first DPD train destined for Karambeli, Vapi. This rail service is one of the key initiatives under DPD to further facilitate ease of doing business at JN Port. The service has enabled prompt and faster delivery of containers directly to the customers in the industrial locations in and around Vapi, Valsad, Sanjan and Umbergaon, further reducing inventory cost and saving in transportation time from the terminal to the warehouses/factories. The train was flagged off in the presence of officials from DP World Nhava Sheva and CONCOR, and was facilitated through special assistance provided by Mr Vivek Johri, Chief Commissioner of Customs, JNCH, said a release.